Boise Daily Photo: Bus or Limo? Looking east on West Idaho Street, downtown Boise. 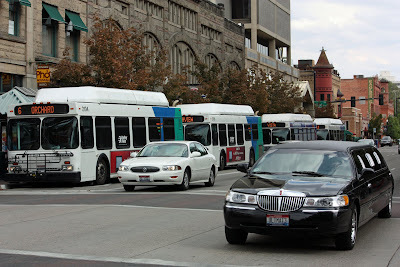 Lots of buses on the left because it is one of the transit centers. It costs $1 to ride the bus - a few more dollars to take a limo instead. One of those is my ride, you have to guess. I'll take the bus, please. I've never been in a limo but I can't imagine it'd be more interesting than the bus. My wallet dictates that I'm a bus person. Probably meet more interesting people, too. It would have to be the limo over the bus, style comfort says it all.